The town and commune of Futaleufu are located in the Province of Palena, Región de Los Lagos (Region of the Lakes), also known as the Tenth Region of Chile. Its estimated population of 2000 inhabitants is engaged in livestock, agriculture, handicrafts and since the last decades also in tourism, which has experienced enormous growth. 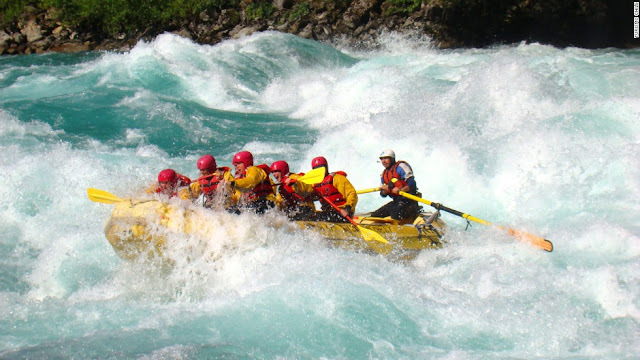 This is due to wonderful landscapes and the rafting and kayak descents of the Futaleufu River, considered among the three best rivers in the World for its Class V rapids. The sources that feed this water course are lakes Amutui Quimei and Futalafquen, located in Los Alerces National Park of the Argentine province of Chubut. 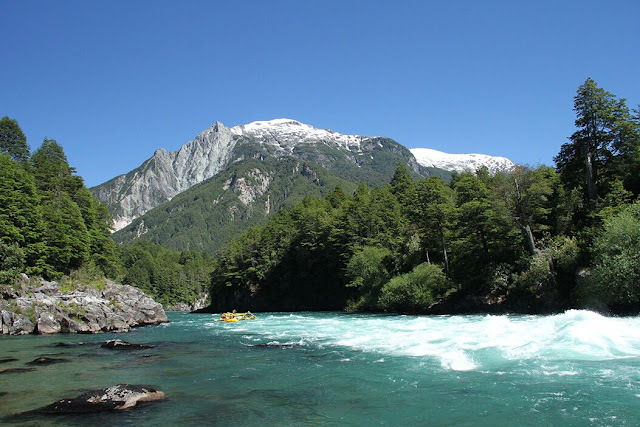 Futaleufu also has the best white waters ideal for the practice of Fly Fishing. The intricate geography of the area also favors the Photographic Tours and the practice of other activities such as horseback riding and hiking through different trails, mountain biking, canoeing along the Rio Espolon, canyoning in remote gorges, kayaking in the various lakes, mountaineering and flora and fauna watching. You may have the opportunity to visit the Futaleufu National Reserve, one of the most attractive areas near the Carretera Austral, located 10 km of the homonymous village, in the area called Las Escalas, created for the protection of the mountain range cypress (Austrocedrus chilensis) and the Huemul (South Andean Deer), a mammal in danger of extinction, which together with the Condor, is part of the Chilean National Coat of Arms. The tourist activity in the town is relatively incipient, however there are several agencies with experienced professionals and high safety standards, to choose the excursions that interest you most. Futaleufu is a remote area of Southern Chile, but even so, access can be by air, sea or land. Air travel can be done from La Paloma aerodrome of Puerto Montt to the village of Chaiten, the trips are by small planes, the airlines make the trip every day except Sundays and the flight lasts approximately 45 minutes. Once you arrive in Chaiten, the rest of the travel to Futaleufu is by bus. The route Chaiten-Futaleufu is a road of approximately 150 kms., the duration of the travel is 3-4 hours and to the present day there are 2 companies that make the route. By sea, from Puerto Montt and Quellon, direct trips are made by barge to Chaiten, the trip lasts about 9 to 10 hours, the remaining travel to Futaleufu is by bus. There is also the possibility of making a bimodal route, this is a combination of land and sea route, starting from the bus terminal of Puerto Montt, the regional capital, under this modality, many places of outstanding scenic beauty will be visited. International Land Route, either by private vehicle or bus. From Chile, the buses start at 06.00, from Osorno and then to Cardenal Samore Border Pass, the bus enters a very touristic area of Argentina passing through the cities of Villa La Angostura, Bariloche, El Bolsón, Esquel, Trevelin and again you enter Chile through El Limite Border Pass, from there, Futaleufu is only 10 km. away. From the Carretera Austral (Chile's Route 7), the second stretch of the currently renowned Carretera Austral (Southern Road), runs between the towns of Chaiten and Coyhaique. With more than 420 kilometers in length this part of the road is one of the oldest of the Carretera Austral, backbone of the region of Aysen. One of its detours leads to the town of Futaleufu (Google Map below). Visitors from all over the world come every year to feel the excitement of going down not only the rapids of the Futaleufu River, but also there is the possibility of practicing a less demanding rafting down the Rio Espolon, a tributary of Futaleufu, where you will enjoy the beautiful landscapes surrounding the river while sailing in calm waters. The characteristics of the Futaleufu River not only make it suitable for adventure sports, but also for fishing since Rainbow and Brown trout, as well as Coho and Chinook salmon abound in its bed. Fly fishing can be practiced in different parts of the river, as well as in Lonconao and Espolon lakes, Rio Espolon and Seno Muerto. Apart from the emblematic Rio Futaleufu, other typical places to visit in this part of the Chilean Patagonia are the Village of Futaleufu, located ten kilometers from the border with Argentina, world-renowned for adventure tourism lovers, a great destination for Summer holidays (Winter holidays if you are in the Northern Hemisphere), enjoying fly fishing, trekking, rafting, kayaking, horseback riding, mountain biking, canoeing, mountaineering and more. Cerro La Bandera (La Bandera Hill), a small trail leads in a few minutes to the top to enjoy a wonderful view of the valley. From all Futaleufu it is possible to admire the Cerro La Bandera, on whose summit permanently waves the Chilean flag, maintained by "Carabineros de Chile" and the Scout group. Futaleufu National Reserve, whose major feature is the surrounding beauty, with lookouts from where you can appreciate beautiful waterfalls and the neighbouring valleys, within its 12,065 hectares there is a virgin vegetation and an extraordinary fauna, we can find protected species such as the "Huemul" (South Andean Deer), represented in the Chilean Coat of Arms, there is a network of hiking trails in the midst of the cypress forests of the Cordillera. Lago Espolon, 8 km. away from Futaleufu, where you can camp, fish and do boat trips, with camping sites and cabins available; Rio Espolon, apart from being one of the tributaries and quieter brother of the Rio Futaleufu, is characterized by the tranquility and transparency of its waters.